Chinese football may have long been mostly known for its underachieving national team and their dismal record against rivals South Korea and Japan, but there is a football team in China that is without doubt the best in Asia, if not the whole world. No, I'm not talking about Guangzhou Evergrande. The Guangzhou outfit have won the Chinese Super League title five times in a row, and have been Asian champions twice in the last three seasons. But they're not as dominant as the football team of Urumqi's No.5 Primary School. Known as Wuxiao in Chinese, the team were crowned champions at the National Youth Campus Football Championship Finals four times in a row from 2012 to 2015, the only four years the national tournament has been held. On the continental stage, they won all four under-13 titles at the international Weifang Cup in Weifang, East China's Shandong Province since they were invited to play in 2011. And they repeatedly beat teams from South Korea and Japan with a winning margin of nearly 10 goals during their run of success at the tournament. Guangzhou Evergrande never did that. Yali Memet is a former football player from the Ili Kazakh Autonomous Prefecture in Northwest China's Xinjiang Uyghur Autonomous Region. After high school his parents did not want him to play football so he went to college to study physical education. After graduating, he became Wuxiao's PE teacher. Now, after working here for 22 years, he is both vice principal of the school and head coach of the school's football team. Even after so many years, Yali is visibly exited when talking about teaching children football. "I heard about their football team when I was still in primary school," Yali said. 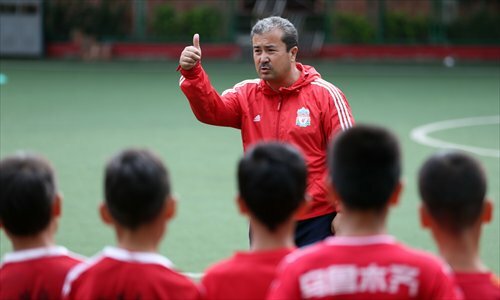 Teaching football at Wuxiao is a dream come true for him. When the previous coach retired, he told Yali, "You must continue the football tradition of this school." And Yali never has let his predecessor down. In Wuxiao's trophy room, nearly 100 trophies from all kinds of tournaments are displayed. "As far as I can remember, in my 22 years working here, we were crowned champions in almost all the tournaments we took part in. We were runners-up only twice," a proud Yali told the Global Times. Most of the trophies are displayed on shelves that line the walls. But several sit on a high rack in the very middle of the trophy room. "These are the most important ones," Yali said, pointing to a high rack which nearly touches the ceiling. They are the trophies for the National Youth Campus Football Championship Finals and the Weifang Cup. "It's a pity that the National Championship Finals is not going to be held this year," sighed Yali. "We won the title in our region, and were waiting for the call to play in the finals. But it seems it's not going to happen this year." 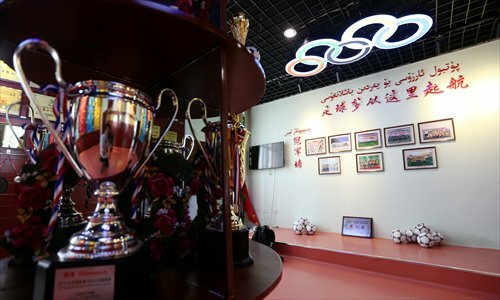 They won the under-13 title at the Weifang Cup every time they have taken part, but last year organizers decided not to hold the under-13 tournament anymore. Yali seemed depressed when talking about the fact that they can't compete at the two high-level events anymore. They are eager to compete against quality opponents, having won the titles in their district and city with ease numerous times. In 2013, Wuxiao made headlines all over the country. In June that year, the Chinese national team were thrashed 5-1 by a second-string Thai team, minnows in world football. Chinese football sank to a new low as the drubbing was considered the most humiliating defeat in many years. But one month later, thrilling news went viral across the country. Wuxiao claimed the Weifang Cup for the third time in a row, making it a perfect seven wins out of seven. They scored an astonishing 43 goals while conceding just three. Most importantly, they beat two teams from South Korea - Chinese football's traditional nemesis - both by 7-0. The team from Osaka, Japan lost 2-1 to Wuxiao. Feeling bitter about the defeat, they asked for a friendly rematch. Wuxiao accepted the challenge and beat them again, winning 2-0 this time. After the second loss, the Japanese coach came to Yali and asked if they were ringers from a professional football club. "No, we're a team from a primary school. They're all students from the same school," Yali replied. As a famous campus football coach, Yali's cell phone seldom keeps silent for long. During the short interview with the Global Times, it rang several times. Each time when he picked the phone, he talked for minutes in Uyghur. "A kid from Tacheng (a Xinjiang city) is coming to visit with his sister," Yali said when he was off the phone. "He's now studying and playing football in a middle school in Tacheng, and is their starting forward. He wants to move to Urumqi's No.117 Middle School and join our football team." No.117 Middle School and Wuxiao combined at the start of this year. "Now after primary school, our kids can go to the same middle school and continue to play football together," Yali said. In the past, after graduating from Wuxiao, the players had to go to different middle schools, and couldn't play together, and a good team that had been training together for years had to be separated. After half an hour into the interview, a boy and his sister knocked on the door of Yali's office. They talked for a few minutes in Uyghur and when they were done, Yali said the boy was named Perhat, and was born in 2003. He came to a take part in a trial for the team of No.117 Middle School, and Yali's colleague there thought he was very talented and wanted him to stay at the team. "He'll go back to Tacheng to take part in matches representing them," Yali said. "After the matches, if his coach gives the green light, he will come here to join our team." The boy's sister, a girl in her early 20s, said her brother loves football and the whole family want him to play in Yali's team. There are around 3,000 students in Wuxiao, most of whom are Uyghur. Almost all the kids love football and play after class. The elite of them are a group of nearly 30 kids. Every day after school, others will leave and this group of kids will stay for a nearly two-hour training session on the playground. One of them is a Han player from Nantong, East China's Jiangsu Province. "Normally all our players are Uyghur, but I'd like to see more Han kids in the team," Yali said. 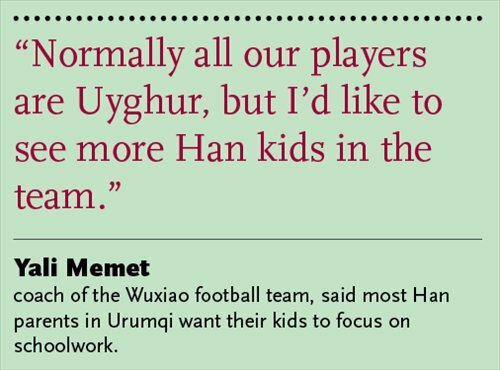 Most Han parents in Urumqi want their kids to focus on schoolwork, and don't want them to spend much time on football, which frustrates Yali. "I want to have different kids in my team," he said. "When we go to play matches in other parts of the country, our players can't understand what the Han kids are talking about, since they don't speak Putonghua. So I posted messages in WeChat groups, asking Han parents across the country to send their kids here to play football with us." Long after he sent the message, just one man got in touch with Yali and took his boy to Wuxiao. 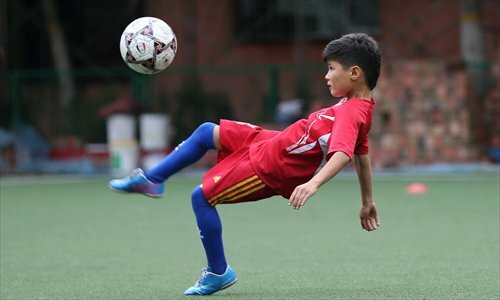 The 12-year-old Han boy, named Guchen Keyu, began to play football one year ago, and his father hopes he can get much better by playing in Wuxiao than in his hometown. After living in Urumqi for just three weeks, Guchen could even talk with his new friends in Uyghur. They also gave him a Uyghur name, Kiyim, which sounds like his given name Keyu. "My father left three or four days after taking me here" to go back to work at a clothing factory in Nantong. "I feel I've improved a lot at football after coming here," Guchen said, who is now living in one of Wuxiao's dormitories. "The training here is very tiring." Yali said he's happy to have kids like Guchen in his team. "He can teach my players to speak Putonghua," said Yali. "And you know what, he really likes reading books. He's always reading and has many books. When my Uyghur players saw his books, they were really shocked." Yali said the Uyghur kids don't like reading normally, and he hopes the kids will fall in love with reading like Guchen. The real reason that Yali wants his players to read more is that he thinks schoolwork is more important than football. "Most kids in Xinjiang don't like schoolwork, and even their parents don't think reading books is useful," Yali sighed. He said a lot of kids don't continue their studies after primary school. Their parents want them to make money as soon as possible so as to ease their own heavy burdens. A lot of his players are from southern Xinjiang, where 83 percent of the 2.61 million Xinjiang residents that are officially designated as "poverty-stricken" live. "Most of the kids will not become professional players in the future. If they quit school so early, what can they do? They can only do some easy jobs, making little money. Some might even turn to crime." Yali thinks schoolwork is still important even for professional footballers. "In China, most professional athletes are not well educated," he said. These players might have won world acclaim and Olympic medals during their playing days, but after retirement, a lot of them lead a hard life as they lack other skills. Some have even had to sell their medals to make some money. "But players in Europe and the US are different," Yali continued. "A lot of them are college students, which also makes them understand their sport better and help them play better. And after their retirement, they can easily start in other businesses." So in Wuxiao, if a kid is not doing well in classes, they will not be allowed to play football with the team. Yali only allow them to train with the team if they've done well enough in classes. "A lot of people have asked me, 'Why are Xinjiang kids are so good at playing football in primary school, but few of them become professional players in the end?'" Yali said. "I blame the different perceptions and customs. A lot of them get married at 17 or 18, and begin to drink and smoke at an early age. That way they're ruined." Yali really hopes reading more books and doing better in school will help his players lead a better life in the future.